Anatomy of a photograph: East Nash Street. This rare postcard depicts an equally rare image of East Wilson’s early business district in the 500 block of East Nash Street. Close examination of the photograph reveals fascinating details, many of which help date the image. The photographer set up his camera near the curb (a surprising feature!) on the south side of the street. First Missionary Baptist Church, built in 1913, would have been across from and slightly behind him. On the far horizon looms the brick bulk of the Hotel Cherry, built in 1917. These commercial buildings supply clues to the location of the photo. The three-story building, constructed in 1894, is Odd Fellows Hall, home to Hannibal Lodge #1552. Its ground floor contained an ever-changing array of store fronts, and a sign for Maynard’s Market/Fish & Oysters is visible here. As early as 1914, Samuel Vick‘s Globe vaudeville and moving picture theatre was housed on the second floor. The sign hanging from the corner of the building pointed the way to the theatre’s side entrance. 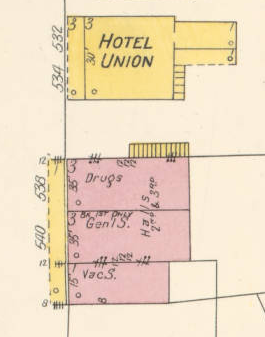 The three-story frame building beside the Odd Fellows Hall was the Hotel Union, managed by Mary Jane Sutzer Taylor Henderson. Here lies a clue to the photograph’s date. 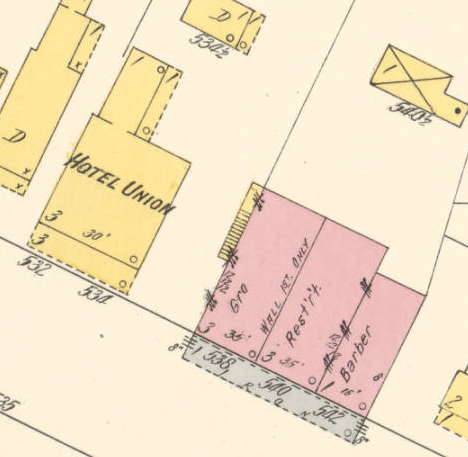 In the 1908 and 1913 Sanborn fire insurance maps, there is an empty lot between the Union and the hall. However, by 1922, a one-story wooden structure, housing a barber shop and sharing a wall with the hotel/boarding house, appears in the gap. See below. (Note also that the theatre’s exterior staircase is gone, traded for enclosed access.) This building, with its shallow gable-end roof, is visible in the postcard image. The Model T Fords (and a single mule and wagon) also help date the photo to the early 1920s. There is an artificial quality about the neatly trimmed hedges and suspiciously uniform trees ranged along the left side of the street. Though this portion of the image may have been hand-drawn, that side of the 500 block was in fact lined with private homes. Families living in this block included the Mitchells, (#540), the Sutzers (#536), and the Yanceys (#538). 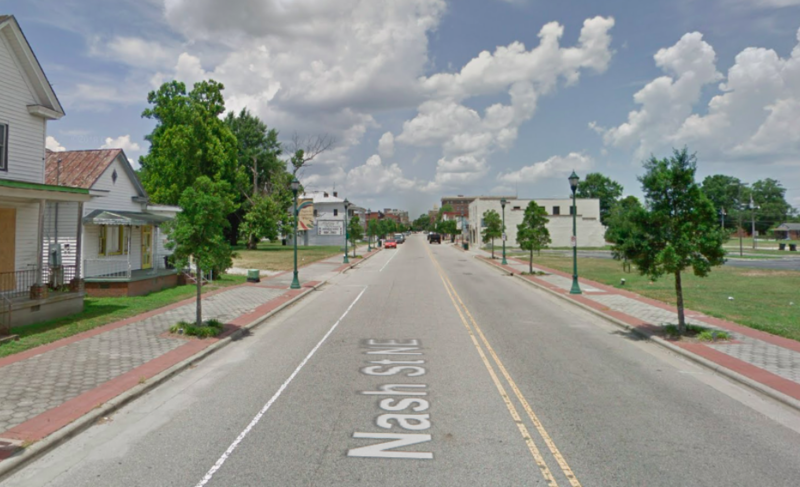 This stretch of East Nash Street today, courtesy of Google Maps. The commercial buildings on the right side of the street, including the historic Odd Fellows Hall, were demolished in the 1990s. Postcard image courtesy of J. Robert Boykin III, Historic Wilson in Vintage Postcards (2003). The Great Christmas Fire of 1868. From Hugh B. Johnston Jr., “Early Wilson Fires Recalled,” Wilson Daily Times, 2 July 1976. Daniel Vick was about 24 years old when he saved George W. Blount’s law offices from immolation. Page 14, Wilson, North Carolina, Sanborn map, 1908. The intersection of East Nash, Pender Street and Stantonsburg Road. (Jane Street down there is now Ashe.) First Baptist’s church was two years away, but an early version of the Saint John A.M.E. Zion building was in place. The Darden Funeral Home building had a bicycle shop and general repair shop on the first floor, the undertaking business on the second, and lodge quarters on the third. 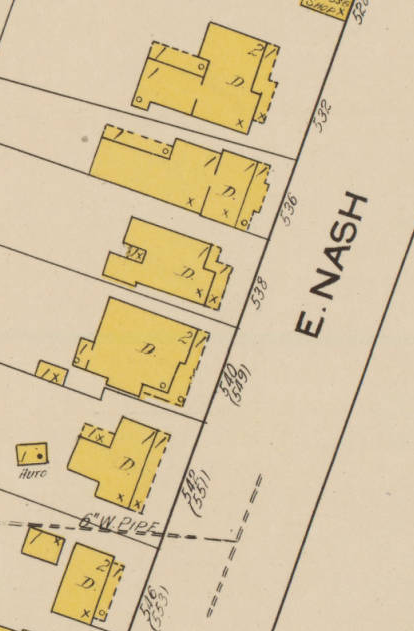 In 1908, the main commercial strip of black Wilson — the 500 block of East Nash — was still primarily residential, but the map does show several general stores (540, 552, 565), a barbershop (528), two cobblers (525 and 526), a drugstore (538), and the Hotel Union (532-534) in place. 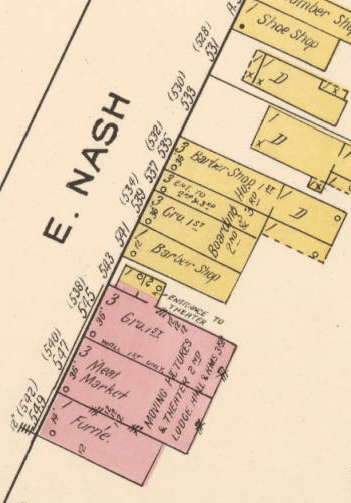 An adjoining map (page 8), which depicts Nash Street from the railroad east, shows at 500-502, a general store; 504, barber; 508, tailor; 514, pool room; 516, bike shop and fishmonger; and 518, meat market.